Hundreds of people are searching online for workplace and office organization tips. What does that tell us? That we could use a little help getting organized, but we have no idea where to start. One place to begin is with your storage cabinets. Are there better, more modern cabinets you should be using? The answer is YES! Here are 4 office storage cabinets for your workplace that are well worth-it because they will definitely help get you organized – and use less space. Rotary file cabinets offer two-sided locking storage for everything in your office including files, office supplies, boxes, binders, books computer media, and more. 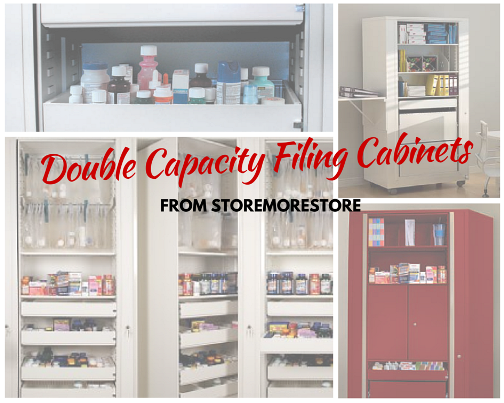 Because these office storage cabinets have two sides and pivot 360 degrees, they provide almost double the storage capacity of a traditional file cabinet in the same amount of floor space. Also, rotary file cabinets are equipped with a lock to prevent anyone without authorization from accessing stored items. Tambour door cabinets are stylish multi-functional office storage cabinets used for all types of materials – files, books, binders, computer media, and much more. The tambour doors slide into the side walls of the cabinet to avoid intruding into the room’s space. And the cabinets are available as individual cabinets or on space saving sliding track systems. Flipper door cabinets work great for both saving space and ensuring that your office presents a clean, professional appearance. Because the doors flip closed, you can keep any clutter hidden away. And just like the tambour door cabinets, you can use the flipper door cabinets as individual storage systems or put them on a sliding track system. If you’re already using lateral file cabinets but don’t have the enough space to add more, you can just add a row of sliding cabinets. The sliding lateral file cabinets an extremely cost-effective solution to get more storage capacity in a small office space. 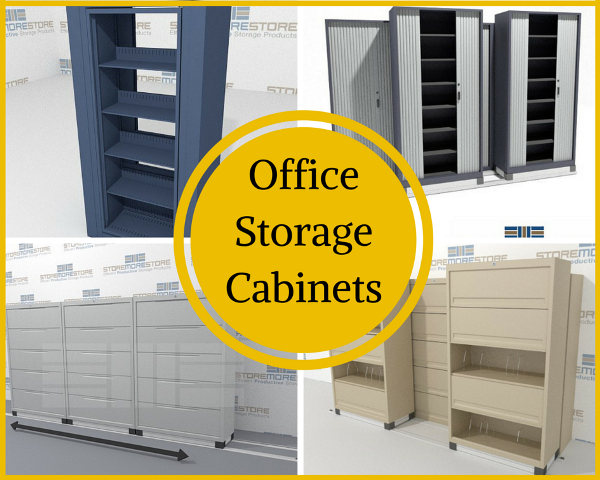 You can find all of these office storage cabinets and much more online from StoreMoreStore! And if you have any questions or need assistance, give us a call at 1-855-786-7667.